2.4. The Pedomorphosis Scenario: Was the Ancestor Sessile or Free-Living? Noriyuki Satoh is a Professor of the Marine Genomics Unit, Okinawa Institute of Science and Technology, Graduate University, Okinawa, Japan. After obtaining a PhD at the University of Tokyo, he carried out research of developmental biology of tunicates at Kyoto University. Satoh and his colleagues have established Ciona intestinalis as a model organism of developmental biology, and he has also conducted research of developmental mechanisms involved in the origins and evolution of chordates. Dr. Satoh’s group has also disclosed molecular mechanisms of notochord formation, and he is one of the leaders of the genome decoding projects of marine invertebrates, including tunicates, cephalochordates, and hemichordates. 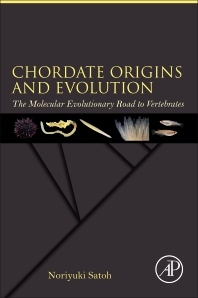 A fascinating review and essential reading for anyone interested in the origin and early evolution of the chordates, in particular how their dorsoventral axis could become inverted as compared to all other Bilateria, while always being compatible with structural and functional viability. My only real quibble was with the quality of some of the figures as a consequence of too great a reduction from the originals.